I learned to recreate geometric elegance, a nice gift for an artist. Learning it via computer was an art experience I want to discuss. I would rather be showing video tapes of the computer generated geometrical images that turned me on, but the printed page is my opportunity for discussing my work. So here I am, a visual artist, giving forth words. By the graces of the Industrial Engineering Department at Stanford University, I performed on the AGT 30 computer (Adage) geometric forms in three dimensionally illusioned space: glowing phosphors of the CRT display delineate a deep dark space. I interact with these TV images through analog controls. The following is an account of my computer art experience. "How did you become involved with the computer in producing art?" I was sculpting in 1969. My boyfriend was reading Suzanne Langer's Symbolic Logic. I read it and felt that I needed logic to organize my approach to making art. 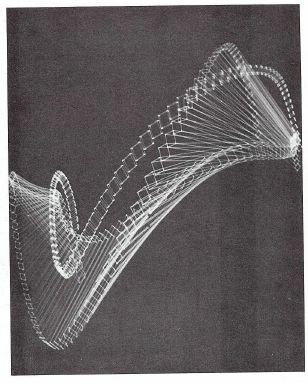 At the University of Massachusetts in 1969, my sculpture teacher, Robert Mallary, was already into the logic of computer art; and my landlord, Robert Archer, was a Computer Science professor. 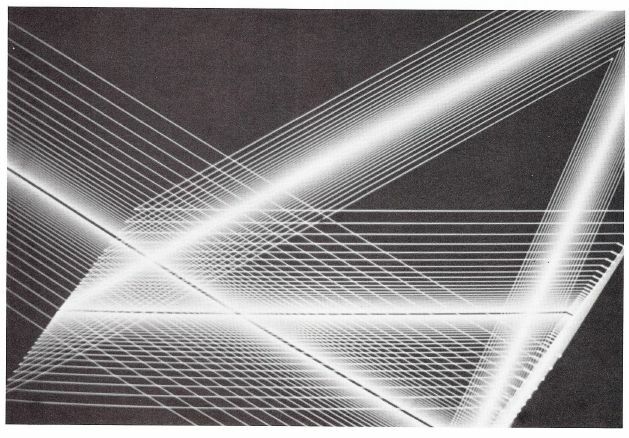 We had access to some sophisticated computer graphics displays at M.I.T. There I saw some graphics that graduate students had created in the wee hours of the morning. They were tired of working on an engineering problem and wanted to create some fun. I considered what they showed me art; I don't know what they called it. By 1971 I stopped sculpting and went to Stanford University to learn about computers. The Art Department at Stanford supported my computer interest for a couple of years before the Industrial Engineering Department took me in. "What is your art background?" Degrees: one Bachelor of Fine Arts degree; and two Masters of Fine Arts degrees, one in ceramics and one in sculpture. Shows: from 1963 to the present I have shown my work in ceramics, sculpture, computer-video, and painting in New York, Chicago, San Francisco, and Palo Alto. In addition, I want to acknowledge in my background the French Impressionist paintings at the Chicago Art Institute which taught me everything about color. Even though my computer work is all black and white, my conception is in color. "What role does the computer play for you?" I gave the computer the role of tool. A tool to translate three dimensions to two, and a tool to animate frames for the moving picture which I would never choose to animate if I had to do it by hand. I used a GRAFX language program written by Bill Brastow, on the faculty of Stanford's Industrial Engineering Department. The program was based on specifications which we put together in some delightful discussions concerning what would be fun to put through the computer. I always felt very serious and business-like talking with this man whose wit and intelligence whizzed around at the spaces where the talk became too technical for me to handle. The shapes which were easy to create with our program could be moved in any dimension by analogue dials controlling the X-Y-Z vectors. It is a very lovely machine—too temperamental about whether it wants to work today or not—but when it works, it works nicely! The program variables included position, shape, speed, scale and length. I could assign geometric paths to the moving forms with these variables. These variables could be independently assigned for each of the three positioning axes and for each object displayed. This meant that a subtle variety of paths was unanalyzable by a viewer. Yet the different factors between variables from one axis to one other was so small, and the final geometric shape simple and elegant, that it astounds the human mind which has no abstract number information. While the eye watches an illusion on two dimensional information, the mind perceives information as if it were three. I put a human-like rhythm in the movements of the geometric shapes, so sometimes they seemed like excited anthropomorphic figures. I used video tape for my hard copy. The computer was a tool for computation, drawing, animating, and displaying art forms. "Are your computer works related to non-computer art?" I feel it is related to the religious art of the old Middle East because of its pure geometry. 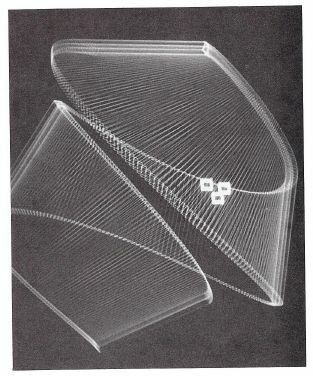 In this century there is a lot of geometric art, take Moholy-Nagy as example of one artist. "Do you have a final image in mind when work begins?" A metamorphosis takes place between my ideas and the medium. I take into account the medium with its advantages and limitations. Eventually, working with a medium I am able to imagine the final material object when the work begins. "Could your work be done without the aid of a computer?" No. At least not by me. It would be tedious to animate. "To what extent are you your own technician?" I can load the program and run it. I have written and run a few simple programs (Stanford computer course homework for the most part). I cannot write programs for the images that I conceive of in my head. "Do you intend to continue using the computer to create art pieces?" Yes, when the machinery, technical artistry to compliment my traditional artistry, and financing, all come together. "Where is your work seen?" Only occasionally in special showings. It has been seen at Stanford University, DeAnza College, in the exhibition circuit at the Bloomfield Art Assoc. in Michigan and galleries in New York and San Francisco.